The Silent Launch – First Speaker Announced! The first of our series of speakers at The Silent Launch has been revealed! We are proud to announce that we will be joined by Jo Horton, Program Manager at Mastercard Foundation Scholars Program & Director of Go Jo. Currently the Program Manager of the Mastercard Foundation Scholars Program at The University of Edinburgh, she is also the Director of Go Jo and Cofounder of Penny in Yo’ Pants, CycleHack, TEDxPortobello, TEDxUniversityofEdinburgh, and Tbilisi’s first ever Race for the Cure. She is also on the board of Tribe Porty and Edinburgh Tool Library. Johanna has spent over 15 years creating cultures, programmes, and experiences that are rooted in values. She has worked all over the world and across numerous sectors including higher education, international development, active transport, sports & culture, and design. If you would like to hear Jo, and our brilliant line up of speakers, join us for The Silent Launch on 29 January 2018 by registering now. With over 1500 people attending 35 events during this year’s Fire Starter Festival we know that there is an appetite for sharing creativity, innovation and burning questions around how we can transform public services. However, we were conscious that many people were restricted in the number of events they could attend and we didn’t manage to capture the ways in which people were inspired to do something differently: on and individual, team or organisational basis. For next year’s festival we thought we could try a ‘Beehive Experiment’ which we hope would allow greater sharing of learning and the opportunity to cross-pollinate ideas. Groups will be formed with members drawn from a variety of public services. Each member of a hive would go along to a different Fire Starter Festival event and then review the impact with their hive. 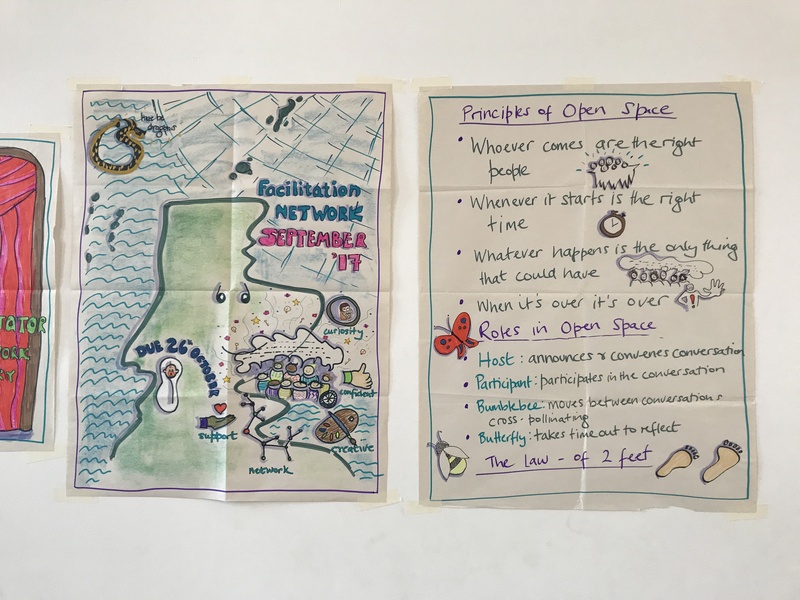 One of the great benefits of our Facilitation Network is the opportunity it gives us all to connect with our peers in what can, at times, be quite an isolating role. The Edinburgh Facilitation Network met for the fifth time on the 26th September, and once again, we had a fantastic meeting of those interested in and practising facilitation in public services. This is very much a collaborative network that uses an open space approach, so that those who are practicing and learning about facilitation are both hosting and participating in sessions. We covered a range of topics including mindfulness in facilitation; both in relation to how to incorporate some mindfulness practices into any events we are facilitating; and also the use of mindfulness for facilitators. There are some resources on mindfulness at the end of this post if you want to find out more. We also had a wonderful graphic facilitation session from Emer O’Leary and a stimulating discussion around how to engage a large number of participants. Our discussions also touched on women in leadership roles and the isolation of the lone facilitator. Many thanks to everyone who hosted and contributed. We were delighted that so many people new to the network joined us and were so willing to share their experience and skills. Here’s what people valued most. The opportunity to learn about a new skill or approach. The opportunity to be with other facilitators in a room. There was acknowledgement that virtual spaces have their place but there was much to be gained by being and practicing together. There was also the recognition that facilitation can be an isolating experience so there was real value in coming together , particularly for those who work alone. This tapped in to a recognition of the importance of support and encouragement people felt they had received. There was also a theme around being brave, taking risks, trying something new, keeping it fresh. This can be particularly important if you want to try out a new approach. The facilitation network can act as a ‘testing ground’, allowing you to gain practice and feedback before you use the approach in your work. We are excited to announce that due to demand, there is now a Glasgow Facilitation Network with their first meeting due to take place on the 27th October 2017. The next Edinburgh Facilitation Network is on 7th February 2018 in Edinburgh, and will be part of the Fire Starter Festival – so please hold the date in your diary. If you are interested in finding out a little more about the Fire Starter Festival you may be interested in attending one of our upcoming information sessions. In between sessions we have a LinkedIn Group where people can discuss facilitation and ask for and offer help. The Facilitation Network was born out of a need to support facilitation in and across public services to help support our Pioneering Collaborative Leadership Programme. If you are interested in this work please contact Karen. Leadership Exchange – Don’t Miss Out! We welcome you to apply to the next application round of our FREE Leadership Exchange Programme. The initiative pairs leaders at middle, senior and executive levels to offer them brief cross sectoral exchanges to learn from each other, develop an understanding of other sectors, encourage collaborative working and improve leadership skill capacity. Over the last 5 years, we have matched over 260 leaders across public, private and third sectors, including representatives from; Scottish Government, Local Authorities, NHS, Scottish Natural Heritage, various Scottish Universities and Colleges, Local and National Charities, Police Scotland, Scottish Prison Service, and Scottish Fire and Rescue Service. With individuals from more organisations engaging with our programme every week, we can offer a wide range of exchange and sector experiences for all our participants. We received 41 new applications in February, our first cohort this year, and look forward to exceeding this number in September. To find out more about the programme, watch our videos, phone Phili Wetton on 0131 243 2755 or email phili.wetton@acosvo.org.uk. To apply in time for the 29th September deadline you can complete the short online application. As 30 May – 4 June is Dementia Awareness Week in Scotland, Karen Lawson, Programme Lead for our Pioneering Collaborative Leadership Programme, wanted to share her own experiences of dementia care, and reflect on what this means for how we can approach public services in Scotland. These were the words my cousin wrote to me in relation to my dad and his dementia. Of course, I knew what she meant, but it doesn’t really convey the complexity of what life is like for my dad or the changing relationship of those who are close to someone with dementia. This is Dementia Awareness week, so I thought I would share a personal story that I hope conveys that each person who has dementia is unique and needs support and care tailored to their individual strengths, interests and needs. Workforce Scotland is a collaborative initiative that supports and enables the public service workforce to work together to deliver the services that matter to the people of Scotland.